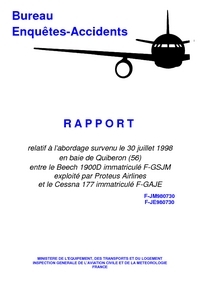 The Beechcraft was approaching Lorient over the Baie de Quiberon when it collided at 2000 feet with a Cessna 177RG Cardinal (F-GAJE). Both aircraft crashed into the sea, 1,5 km from the 980 feet long cruise ship 'SS Norway' and sank 30-50 feet below the sea level. The Cessna was on a private flight from the nearby Vannes airfield. Just prior to the collision the pilot of the Beechcraft had requested permission to modify their flight plan and to descend below 3000 feet in uncontrolled airspace under VFR conditions. This was probably done to take a detour and overfly the cruise ship, which is the biggest ocean liner ever built in France. The Cardinal pilot was a 69-years old retired Air Inter captain with over 20000 hours of flying time. - le Cessna 177 avec son transpondeur éteint ne pouvait pas être visualisé, sur son écran radar, par le contrôleur de Lorient. De ce fait celui-ci n’a pas pu faire l’information de trafic à l’équipage du Beech 1900D." Distance from Lyon Satolas Airport to Lorient-Lann Bihoué Airport as the crow flies is 683 km (427 miles).